Want to reach a truly global audience? We all know the big name social networks for English-speaking audiences—Facebook, Twitter, Snapchat, etc.—but what about ones that are popular in other regions around the world? There are lots of social networks used around the globe that can teach us a thing or two about e-commerce, virtual reality, and the future of messaging. We’ve listed some popular networks to give you the insight you need to take your social media strategy global. Used by half a billion people, WeChat is a messaging and calling app that’s most popular in China. It’s an all-in-one messaging app for test, voice, and video calls across countries. It recently introduced City Services—which allow users to do a bunch of things in their local area like book doctor’s appointments, pay electricity bills or traffic fines, and book flights—in select cities in China. Users can make payments through WeChat Wallet. 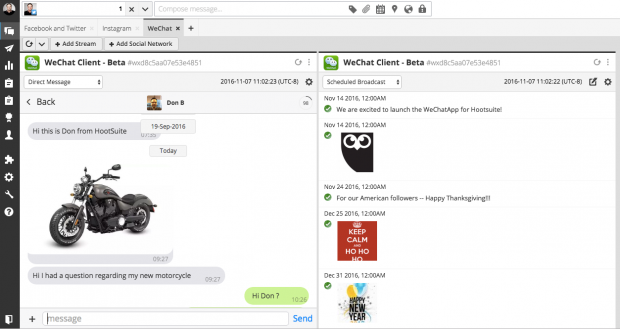 The WeChat app for Hootsuite allows users to send or schedule messages to WeChat followers. Image via Hootsuite App Directory. Sina Weibo, also known as Weibo, is a microblogging platform used in China. It’s often equated with Twitter, with a 140-character limit and the ability to like, share, and receive @comments and messages. With Weibo Radar, users can also find friends and daily deals in their neighborhood. The Sina Weibo app for Hootsuite allows users to search, share, schedule, post content, and monitor feeds. Line is one of Japan’s most popular social networks. It offers free voice calls and messaging to anywhere in the world and allows users to share photos, videos, voice messages, and location info with their friends and family. Line is also known for its thousands of stickers of recognizable celebrities and Line characters (which are from the app’s popular avatar social network called Line Play). While Line has strict advertising rules, users can follow the accounts of their favorite celebrities and brands to get news and product discounts. There’s also a Line Store for online shoppers. KakaoTalk is an instant messaging platform from South Korea. It has video and voice chats with unique filters, events and announcement boards, and chatrooms. Users can send photos, voice notes, and location in messages. They also have a Gift Shop where users can buy directly from the app. VKontakte (VK) is one of Europe’s largest social networking sites and is particularly popular among Russian-speaking users. VK lets users message, create pages and groups, share and tag images, upload photos and videos, and play games. It has a Facebook-like interface with the ability to chat and connect with friends easily. QZone was created in 2005 by Tencent and has become one of China’s most popular social networking platforms. It’s used for writing blogs, watching videos, sharing photos, and listening to music. You can customize your profile by buying accessories from the platform. As it continues to grow in popularity, QZone is honing in on messaging, gaming, and online shopping for its users. Also created by Tencent, QQ is an international chat and call app. Popular in China and available in many other countries all over the world, QQ has over 1 billion registered users. It has a unique, built-in translation feature that allows users to speak with friends in different languages. It offers video calling, voice chats, and texting all within the app. Taringa! is a social network aimed at a Latin American audience. It allows people to share thousands of posts on a variety of subjects such as recipes, news, technology, and art. Once users join, they create content and get feedback from their community. Top-rated content gets featured on a prominent spot on the network. Users can also join different communities based on their hobbies and interests. Badoo is a dating social networking platform popular in Latin America, Spain, Italy, and France. The app shows other users that are nearby so users can find people that they’ve run into in real life. Once users have made a connection, they can chat on the app. Anyone can join Badoo for free, but they need to pay for premium features. Skyrock is a blogging and messaging site based in France offering users free web space to create their own profiles and blogs. It’s geared towards musicians and other artists that want to share their work. In 2015 it was ranked the seventh largest social media network in the world. Xing is a business networking and recruitment site used in Asia. Users can follow industries, brands, events, and news that they’re interested in. Like LinkedIn, users can also use Xing to search and apply for jobs and connect with communities to develop relationships with potential employers and thought leaders. Tuenti is a popular social networking site in Spain. Beginning as a Spanish alternative to Facebook, Tuenti now focuses on calling and messaging through its app. It offers free calling between users that have the Tuenti app, international calls without roaming, and allows unlimited chat with photos, sound, and voice filters. As brands grow their audiences across continents and into new markets, it’s important to understand other popular social networks and how they are being used. It can tell you a lot about cultural differences in online communities and future trends on social.